ORIGINAL BROCHURE. Original Sales Brochure. Malibu Classic Landau Coupe. Malibu classic coupe. Malibu Classic Sedan. Malibu Classic Wagon. Malibu Sedan. Malibu Coupe. 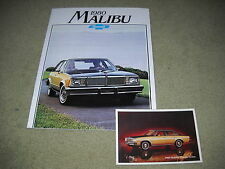 1978 CHEVY NOVA AND MALIBU SALESMAN GUIDE BROCHURES. HAS GREAT COLOR AND NO RIPPED PAGES. Sales Brochure. 28-page brochure on the models. 2011 Chevrolet MALIBU. Your Source. LS, LT, and LTZ trim levels. 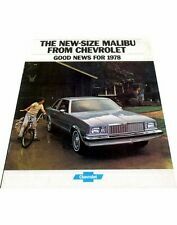 Here we have a1978 Chevrolet Malibu sales brochure. This is an ORIGINAL brochure, NOT A REPRINT. 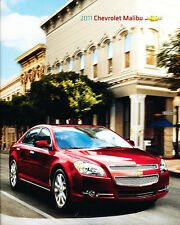 This brochure covers the following models Features of this brochure Malibu Classic in sedan/coupe/wagon. 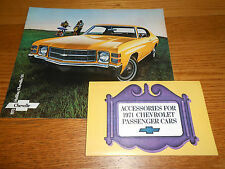 And you ALSO GET CHEVROLET'S 6 Panel FULL COLOR ACCESSORIES BROCHURE for 1971 SHOWING and DETAILING EVERY ACCESSORY AVAILABLE for EVERY CHEVROLET CAR! Greencastle, PA 17225. 357 Blue Bird Trail. Paul Politis. ORIGINAL BROCHURE. Sales Brochure. L,LS, LT, Hybrid and Premier. Unique historical ORIGINAL Literature item. (may have slight wear marking associated with storage). PA475/400/511/205. VALUE PRICED ! Brochure outlines the new 2019 Malibu along with color options. Here we have a1965 Chevrolet Chevelle sales brochure. This is an ORIGINAL brochure, NOT a reprint. This brochure covers the following models Features of this brochure Highlights many of the great Chevrolet features found in these vehicles. 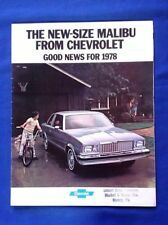 Original, color, 1972 Chevrolet SPANISH Text sales brochure for Malibu, Chevelle, Heavy Chevy, and SS styles/models. Read about interiors, styling, performance, nice color photos. Good condition. Chevelle in SS396----Malibu----300----Stationwagons. Here we have a1966 Chevrolet Chevelle sales brochure. This is an original brochure NOT a reprint. This brochure covers the following models Features of this brochure. Here we have a1971 Chevrolet Chevelle sales brochure. This is an ORIGINAL brochure NOT a reprint. Chevelle coupe/sedan----Malibu coupe/sedan/convertible----SS coupe/convertible. This brochure covers the following models. 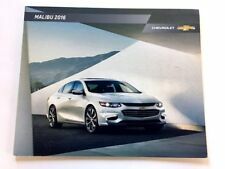 Here we have a2016 Chevrolet Malibu Limited sales brochure. This is an ORIGINAL brochure, NOT a reprint. 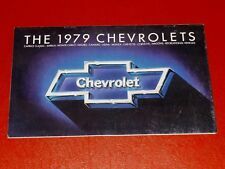 This brochure covers the following models Features of this brochure Highlights many of the great Chevrolet features found in these vehicles. 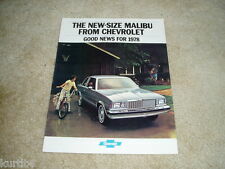 1981 Chevrolet Malibu Sales Brochure. 1981 Chevrolet Malibu. Sales Brochure Book. 20 page comprehensive brochure exclusive on the model. Classic Wagon. Classic Landau Coupe. Classic Sport Sedan. Your Source. Color and upholstery -- examples of the paint and upholstery. However, they are often the only source for hard-to-find upholstery swatches - these are actual fabric samples and not printed images. You also get samples of vinyl roof materials, carpet, and striping. Sales Brochure. 16-page original dealer sales brochure. Deluxe brochure on the models. 2009 Chevrolet Malibu. Your Source. An excellent literature piece for the enthusiast/owner. VALUE PRICED ! One original dealer's showroom brochure for the 2019 Chevy line including Camaro, Corvette, Traverse, Malibu, Impala and more. Contains nice color pictures and model specifications. In good condition. ORIGINAL BROCHURE. Original Sales Brochure. Unique historical ORIGINAL Literature item. Exterior color paint choices shown. An excellent literature piece for the enthusiast/owner. (may have slight wear marking associated with storage). ORIGINAL BROCHURE. Original brochure. Unique historical ORIGINAL Literature item. exterior color paint choices. An excellent literature piece for the enthusiast/owner. (may have slight wear marking associated with storage). 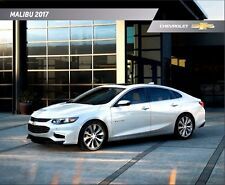 This is a new, never displayed or distributed, 2017 Chevrolet Malibu dealership showroom sales brochure. It contains pictures of L, LS, LT, Hybrid, & Premier models and options. From the driver and passenger friendly seating, the excellent cargo space to the integrated technology for safety and convenience, this brochure covers all options available on each model of the all new for 2017 Malibu. Please ask if you have any questions. All items ship USPS with a tracking number emailed to you at time of postage purchase so you can follow your item to your door. Color and upholstery -- examples of the paint and upholstery. However, they are often the only source for hard-to-find upholstery swatches - these are actyal swatches and not printed images. You will find that this is far more detailed than a sales brochure. This is an illustrated accessory album that was used at the Chevy dealer. This was NOT handed out to customers, but kept at the dealership. It's larger with longer descriptions and more items than smaller pamphlets that were handed out to customers. You can use this book to restore your vehicle to its historic best, upgrade with factory options, or to authenticate equipment already installed. You'll see color illustrations, paragraph descriptions, and even part numbers for dealer-installed accessories. You'll see accessories for safety, convenience, appearance, comfort, interior, and exterior. There are too many to list them all, but some of them include a/c, heater, radio, seat belts, chrome guards, lights, mats, mirrors, trailer hitches, locks, hubcaps, luggage racks, clocks, and much more. 2004 Chevrolet Canadian Sales Brochure. The brochure has pictures/illustrations of the various models and information on features. Malibu Maxx. Details: W 9.5 xH 6.5 xD 0.1. The front page has a blemish along the top edge. Here we have a1975 Chevrolet Chevelle sales brochure. This is an ORIGINAL brochure NOT a reprint. Laguna Type S-3----Malibu Classic coupe/sedan----Malibu coupe/sedan. This brochure covers the following models. Sales Brochure. 34-page Original Sales Brochure. 2013 Chevrolet Malibu. PA-209/233/249/BOX. Your Source. An excellent literature piece for the enthusiast/owner. 2004 CHEVROLET MALIBU AUTO SHOW/SHOWROOM SALES BROCHURE. 1979 Chevrolet Malibu. Sales Brochure. 16-page brochure on the model. PA-113/PA-214/229/OS. Your Source. Here we have a2017 Chevrolet Malibu sales brochure. This is an ORIGINAL brochure, NOT a reprint. This brochure covers the following models Features of this brochure Highlights many of the great Chevrolet features found in these vehicles. "1968 Chevelle Custom Feature Accessories" This is a quality reproduction of the catalog that allowed original Chevelle owners to deck their cars out with original Chevrolet accessories. You will find color illustrations of factory options such as chrome exterior moldings, bumper guards, wheel covers, lights, luggage carriers, floor mats, interior accessories, radios, and more. You can use this catalog to find out which features on your car are accessories, if those accessories are original, and which accessories you can add. Covers the 1968 Chevrolet Chevelle line, including Malibu Convertibles, 2- & 4-door hardtops, Station Wagons, and Super Sports. 12 pages, New condition. Buy now to find out how to make your car into a "loaded" model. BROCHURE includes GREAT PICTURES and INFORMATION on CAPRICE, IMPALA, MALIBU and VEGA WAGONS plus SUBURBAN, SPORTVAN and BLAZER. YOU GET BOTH! 357 Blue Bird Trail. Paul Politis. SERVING the COLLECTOR CAR HOBBY and MOTORING PUBLIC SINCE 1974. Sales Brochure Fact Sheet. 2008 Chevrolet Malibu. 2-sided fact sheet on the Malibu. Your Source. Here we have a 2004 Chevrolet Malibu sales brochure. This is an original brochure NOT a reprint. It is in VERY GOOD condition. Features of each model are highlighted along with options and specifications. This is a new, never displayed or distributed dealership sales brochure. It shows interior options, engine and drivetrain packages, available wheels and many more items available for the 2018 Malibu. If you have any questions, please do not hesitate to ask. All items ship USPS with a tracking number emailed to you at time of postage purchase so you can follow your item to your door. The book explains the styling designs for each model. Buy now to be one of the few collectors to own this privileged information. 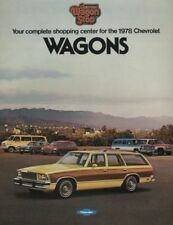 Exact Title: "1973 Chevrolet Salesman Product Information". 1973 Chevrolet C10 Suburban. Here we have a1977 Chevrolet Chevelle sales brochure. This is an ORIGINAL brochure NOT a reprint. Malibu Classic coupe/sedan/wagon----Malibu coupe/sedan/wagon. This brochure covers the following models. Original color, sales brochure for the Chevrolet Chevelle Custom Feature Accessories for 1968. Includes Malibu Sport Sedan, Super Sport Convertible, Concours Station Wagon, Malibu Sport Coupe, 300 Deluxe Sedan, and 300 two-door coupe. Color and upholstery -- examples of the paint and upholstery. However, they are often the only source for hard-to-find upholstery swatches - these are actual swatches. Pictorial Dealer Album -- You will find out the dealer's "inside information" that is far more detailed than a sales brochure. Great brochure! XCL condition,,XCL communication. we have literature on most every car ever made.just ask! Knows Brochures, Professional, Finds The Hard To Get, Honest, Would Buy Again. # of pages : 16. ORIGINAL BROCHURE. 32-page Original Sales Brochure. Unique historical ORIGINAL Literature item. and color paint choices. An excellent literature piece for the enthusiast/owner. (may have slight wear marking associated with storage).